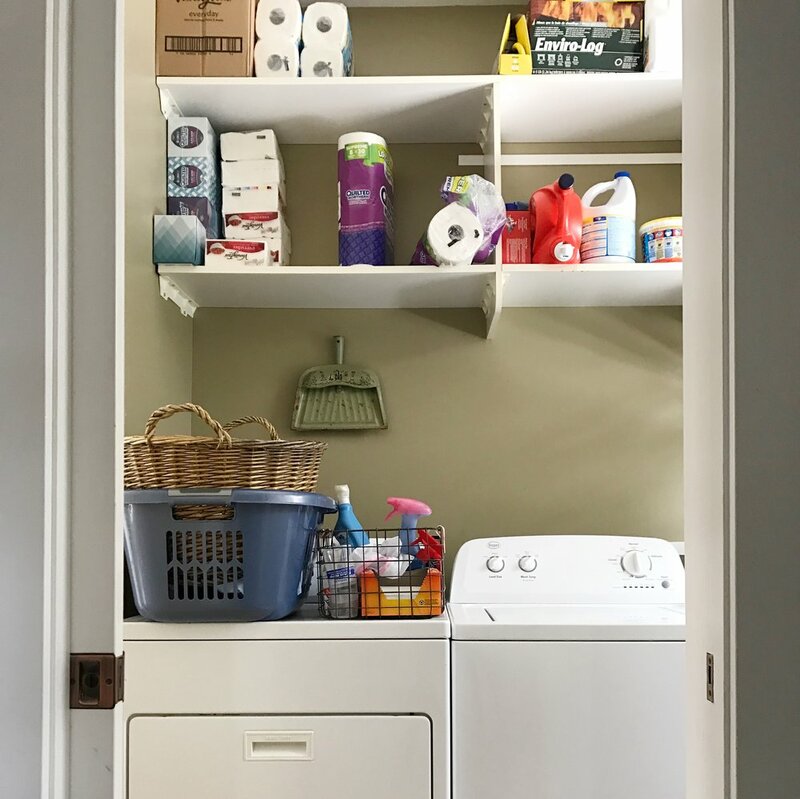 We've lived in our house for 5 years in July, and since we first moved in I've wanted to create a nice laundry space - but with a growing family and busy schedules it's never made it to the top of my list. 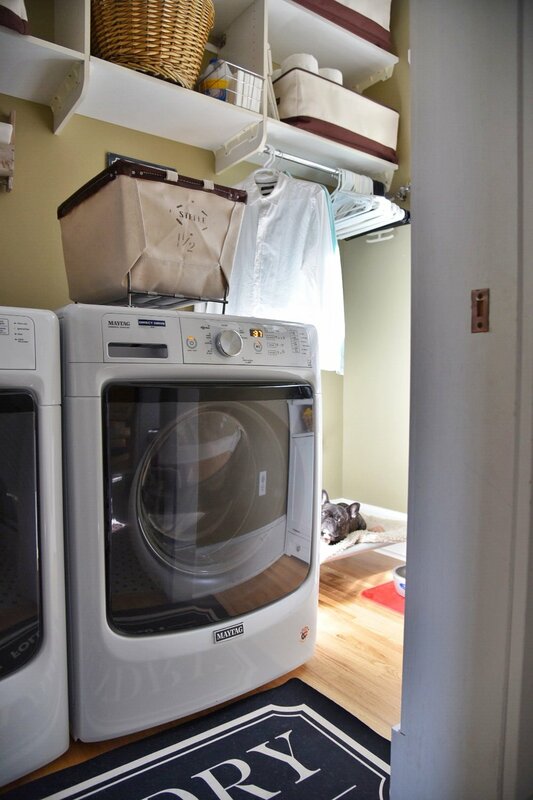 Our first house had the laundry setup in the dark and creepy unfinished basement, so it was less than ideal. Our current home has a great, though quaint, area attached to the mudroom just outside of the master bathroom with lots of open storage above it. The open shelving has been perfect for holding extra supplies, but also made them look rather unsightly. Before: Note the recessed lights and chaotic shelves. 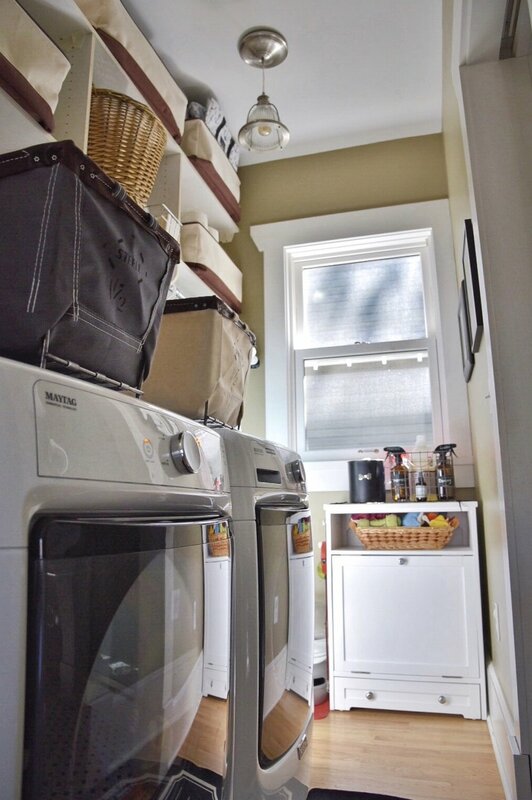 A few weeks ago our dryer went out, which gave me the perfect excuse to freshen the entire space up. I considered painting the walls since I don't super love the green color, but decided that would only slow me down since it would mean repainting our entire mudroom. Instead I wiped down the walls and removed every single thing from the shelves. We also keep our dog bed, food and supplies back here, so I knew I needed something better to organize their stuff. I started by visiting Lowe's to order our new washer & dryer. They had great reviews and could be delivered quickly so I was sold. While I was there I also picked up the black laundry rug. I've had numerous rigs back here through the years and inevitably a dog destroys it, so I prefer to only spend $25 on one. Next I ordered the white pet feeder station, which includes a pull out cabinet for dog food storage and pull out drawer at the very bottom for their food bowls - genius! I love the canvas collapsible storage bins for the shelves because they hide my unsightly supplies and look nice and clean. 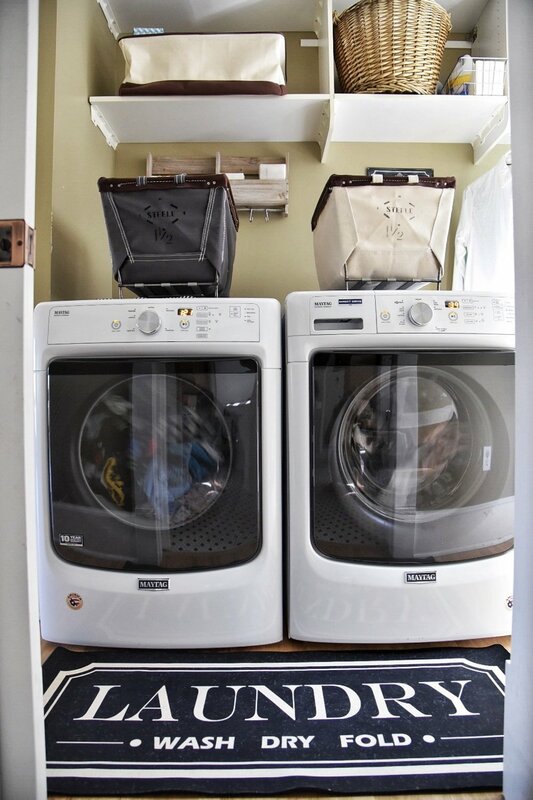 I wanted to carry this look down into the laundry baskets, so these durable bins - which I'd been been eying for months - were a bit of a splurge, but were a perfect fit since I needed them to fit on top of the washer & dryer instead of stand alone. Previously I had plastic hampers and didn't love the look of of them so I was excited to find these. My least favorite part of the laundry area was the recessed light fixtures. I don't mind recessed lighting in some spaces, especially as supplemental lighting, but for the laundry room I wanted something nicer. Maybe to make the act of doing laundry seem a little more fancy. Ha! I found this adapter kit and fixture and they worked great - and were so easy to install. Lastly I added the wall shelf and print to finish everything up. The shelf ended up being a little hard for me to reach so I don't know that I'll leave it there, but it looks cute! 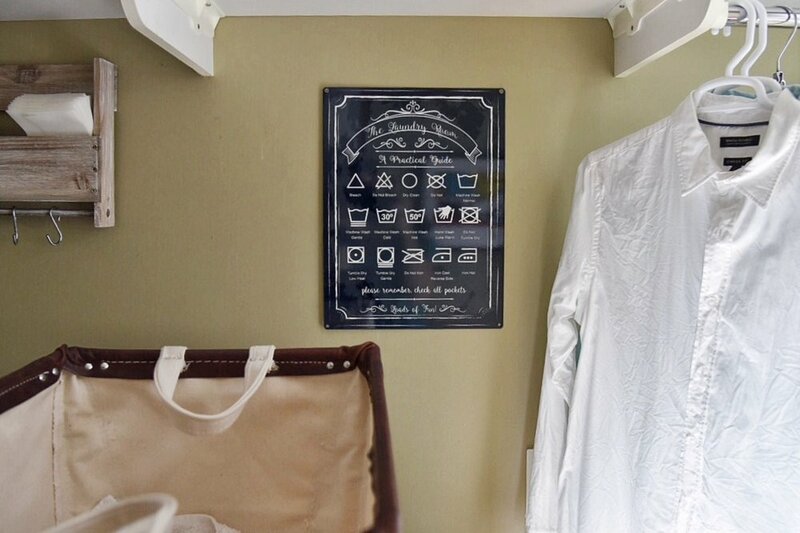 The laundry guide print actually explains all the symbols I've often seen on laundry but never knew what they meant, so in addition to looking nice it's also helpful. Double win! Overall I love how everything turned out. While having an appliance go out isn't ideal, I'm glad in this case it worked out for the best. I can honestly say, laundry has been a more pleasant experience since making the updates!